Lenovo sure has been busy this CES. As if the Snapdragon-powered Skylight netbook wasn't enough, what about this, the U1? 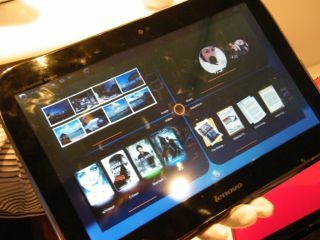 It's a notebook with a detachable screen which becomes a Snapdragon-powered internet tablet. When the IdeaPad U1 is in its traditional clamshell form, the system boasts an 11.6-inch HD LED screen and runs Windows 7. When the multitouch screen is removed, it's an independent slate tablet running Lenovo's new Linux-based Skylight operating system. Think about it – this could be really very useful . You can use it as a standard laptop, but when you don't need a keyboard you can just use the screen to get online (although most of us are now used to using smartphones for this). The Snapdragon chipset boasts integrated 3G, so the tablet can be always online. The main laptop runs Windows 7 on a low-power Intel processor – model to be confirmed. Cleverly, the two different processors can work together to share battery power and wireless connectivity. Lenovo says its Hybrid Switch enables seamless toggling between the two processors so you could be surfing the web in laptop mode and then continue from the same point without interruption when you detach the slate – very clever indeed. The U1 is set to ship in the middle of the year and the US pricing has been announced at $999 (£624), so while it's not quite the cost of a notebook plus a netbook, it's not too far off.